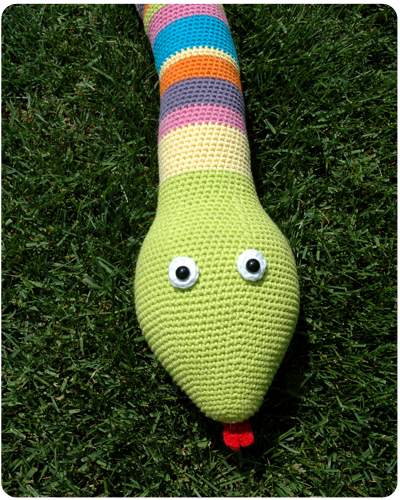 Remember this long winded post where I talked about how I was crocheting a snake? How he was turning into a long colorful tube that I had no idea what I was going to do with, and how because he was so stiff I had to hold my arms in the air in order to work on him causing me great pain as I crocheted? Remember how I was going to abandon him, rip him apart and use the yarn to make a blanket. Yes, remember my huge ramble about all of that? Well things changed. 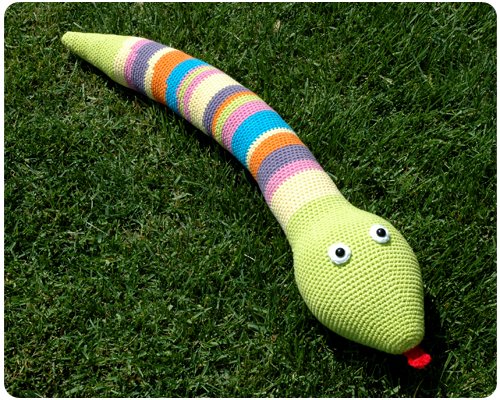 At the insistence of my children - the fact that they cried when I unraveled just a few stitches, and their emotional begging and pleading that the snake not be abandoned - I have finished him. It was not too bad. I just added his tail, made eyes and a tongue, stuffed him up, and he was done. I do think he looks a little odd: his head seems awfully large for such a short body, but oh well. One completed snake, two happy children. P.S. I still do not know what to do with him - the girls played with him for a bit, but the novelty quickly wore off. And since I still have tons of this colorful cotton yarn, making a blanket is still on my 'to do' list. Oh thank you Becky. He is growing on me...his head seems a bit more proportional to his body the longer I look at him. I am glad I finished him. Such a great story... definitely made us smile! He is so cute.. and colorful... just use him as a centerpiece! hahaha. Found your great post on Kreative Creationz Thursday Obsession. Be sure to come by our weekly BeBetsy Link and Hop! Sharon and Denise, thanks for visiting. Looking forward to linking up to your party! What a fun story!!! I think my son would have reacted the same way. Thank you for linking it up at Crafty Thursday Obsessions. We are going to feature it this week :) Hope you stop by to check it out & link up with us again! 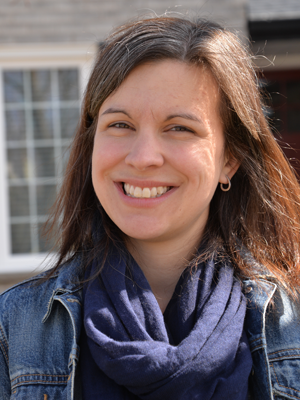 Thanks so much for stopping by and for featuring my project on your blog.